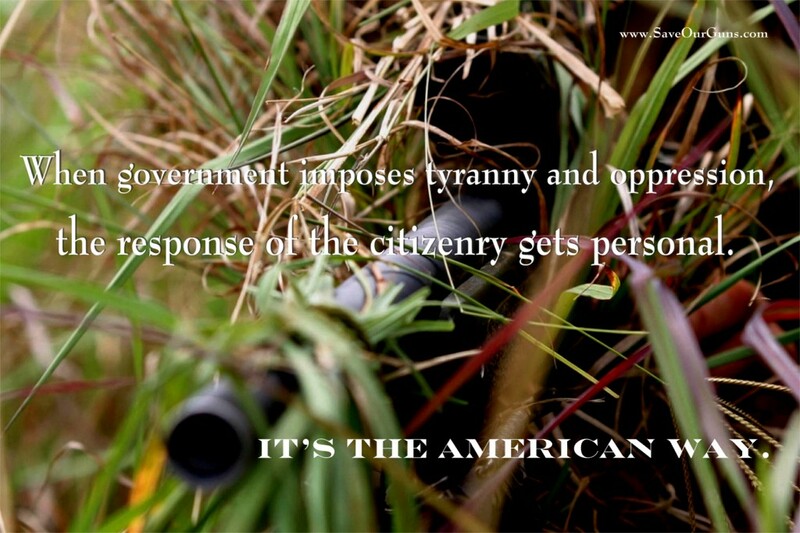 The INDIVIDUAL Right to Keep and Bear Arms - It's your DUTY; It's your Right! BEDFORD, Va. — It's the kind of place with a picturesque courthouse on Main Street. A town where time moves more slowly than in other places. The town of Bedford also holds a somber distinction. This community gave up more of its sons per capita on D-Day than any other community in the country. Twenty-one headstones in the local cemetery are engraved with the same date: June 6, 1944. Bedford was a town of 3,200 at the time. The boys from Bedford were all part of Company A. Many were patriotic young men who left wives and girlfriends behind — young men who were asked to grow up very quickly. One of those young men was Roy Stevens, who now passes time watching the workmen build the new National D-Day Memorial near Bedford. "I sure would like to see it finished. Because of Ray, I'd like to see it finished so I could come up and say they did something," Stevens, a retired factory worker, told Fox News. Ray was Roy's twin brother. Both were headed to the beach that morning. But, Roy's landing craft sank and he was rescued. Ray's boat made it to shore only to face the German onslaught. "Four days later I came back in on the beaches there. I wandered over to the cemetery. I heard rumors that some of them got killed there. The first cross I came to was Ray and it had his dog tags on it," Stevens said. "I put the machine on -- the teletype machine -- and I said to Roanoke 'Good Morning, go-ahead, this is Bedford' and the operator teletyped back to me 'I have casualties'," Elizabeth Teass, 77 and now retired, said. "We were the only family in Bedford that lost two sons on D-day," Lucille Hoback Bogess, a former county supervisor, said. Bogess was 15 when her family learned that her brother Bedford had been killed. A few days later, a second telegram — her brother Raymond was missing. His body was never found, but his Bible was. It was returned to the family with a letter from the young soldier who found it. 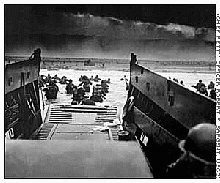 "While walking along the beach D-Day plus one, I came upon the Bible. As most any person would do, I picked it up from the sands to keep it from being destroyed," Bogess read from the letter she has kept for 56 years. "When you take 19 young men out of a community like this it leaves a vacuum that I just don't think we've filled," she said. 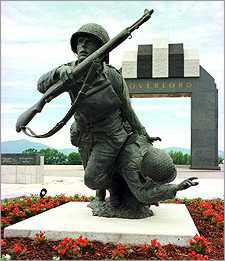 On Memorial Day this year, the town unveiled a statue that will be part of the memorial to honor the dead. It's called "Death on Shore" and it's supposed to represent each of the young men from Bedford who died that day on Normandy Beach. This particular statue, though, has brought a tear to the eye of many people from Bedford. Falling out of the knapsack of one of the boys represented on the beach is a holy Bible.